By all accounts, the Oilers are the better team and are deservedly heavy favorites. But the Flyers are gritty, well-coached, and determined. And I can’t take my eyes off the game. I’m mesmerized by the back and forth action. Is there a way to make myself not blink? The intensity brings me to chest pains. The Flyers would go on to lose the series in seven games. Some have called it the best series of all time. I don’t know about that. I do know that it is as passionate as I have ever felt about a sports team. I watched every moment of the action. Some of that viewing time was with other people including family and friends. We talked a bit – about the game and other things. It was nice. But being in my room, by myself, watching the games… It was intense. Every serious sports fan dreams of his/her team making it to the sport’s championship round. Ahh, isn’t it great to have your team be a winner. Anyway, in case you do not know, the Philadelphia Eagles are in the Super Bowl (against the New England Patriots). To say I’m excited is an understatement. 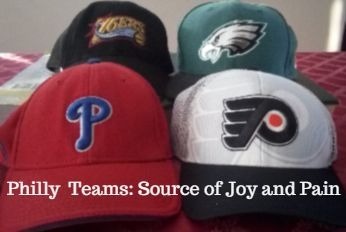 Like the Flyers team described above, the Eagles are going against a team that has won enough to be considered a dynasty. A team that arguably features the greatest quarterback of all time. A team that is coached by arguably the greatest coach of all time. The Eagles, on the other hand, are being led by a backup quarterback, Nick Foles (after their MVP caliber starter, Carson Wentz, was injured during the season). Foles contemplated retiring a couple of years ago due to frustration and disappointment with how his career was progressing. The Eagles have a number of players who were low draft picks and others who were free agents. Unsurprisingly, the Eagles are underdogs in the Super Bowl and opened up as the biggest underdog since 2009. They’ve been underdogs through their first two games in the playoffs despite being at home and the number one seed in their conference. Rather than being daunted by the underdog label, they’ve embraced it and used it as inspiration. Some team members and fans have been wearing dog masks. This underdog status has the made team even more lovable. So, how do I view the game? The Super Bowl has become an event. It’s about the commercials. The national anthem. The halftime show. The food. etc. it’s fun. But do I want fun? Or do I want to WATCH the game? I mean the kind of watching where my chest might hurt? The kind of watching where I won’t get up to go to the bathroom till halftime. The kind of watching where I’ll hear every word the announcers say. My oldest brother, HB, invited us to his house for a Super Bowl party. He invited my other siblings and other family members. Watching and hopefully, celebrating, with my family sounds pretty great. So, I’m getting off the island, leaving my room. We will go to my brother’s house to watch the game. I’ll enjoy their company. But I’m still not missing one moment and might even feel a pain or two. This entry was posted in Family and tagged Sports, stanley cup, superbowl by lardavbern. Bookmark the permalink. I always prefer small gatherings for big sporting events. Its nice to be around people but too many, especially too many of those just there for the party, and it gets annoying. For the Super Bowl party I’m going to, it’s family and they are all into it. I’m struggling with who to cheer for… As a Cowboys fan, I can’t cheer on the Eagle, but there is no way I can cheer for the Patriots… so, this might be the year I cheer for the commercials! I understand the dilemma you had Kate. I hope in the end at least a part of you was rooting for the Eagle if only for your pal, MMK. Anyway, I’m just grinning. So happy. Btw, I thought the commercials were weak. I loved the one with Manning OBJ. Very funny.